Another very busy week for us. Yet, when I did find time one late afternoon to work in the garden, others sipped while I worked. We have those same little butterflies. The boys love to watch them. I too love to watch butterflies flit from blossom to blossom. Looks like alot of us had similar butterfly opportunities this past weekend. Always nice to work in the garden! Lovely collage. There's nothing better than sitting back and watching 'Dragons' and 'Flutters'. Lovely flowers and insects in your garden! Such a calming thought. When it cools down this evening I'll go out and continue tending too. Love the mosaic. Have you seen any monarchs?? Nectar of the gods being sipped? Pretty shots of the butterflies and dragons.. You deserve to take a break, from all that work.. Have a happy week! 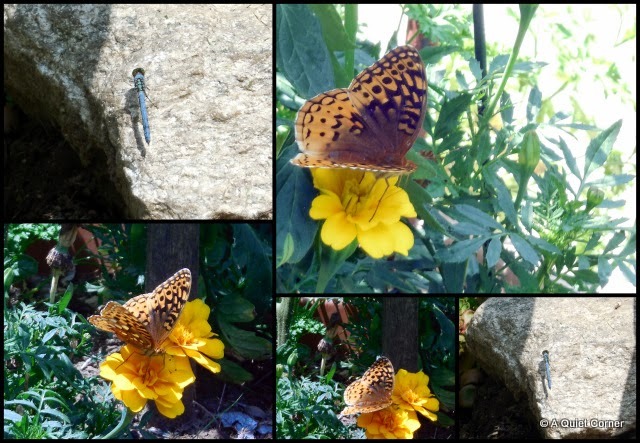 I am enjoying watching the butterflies on our farm right now too. I love them. What a great looking butterfly. He was working hard too.